Clay pots are very plant-friendly: they keep the soil cooled inside the pot in the summer, they prevent water from being trapped inside the pot, and their pleasant reddish color gives them an attractive natural look as well. Then again, as they “get on in years” they absorb minerals, calcium, and salts from water and fertilizers, which ultimately makes them look ugly. So, if you want to restore their original glory, use plenty of vinegar to clean and disinfect them. The use of vinegar is a great way to eliminate weeds persistently popping up on garden walls, or sticking out from the crevices of walkways. You should simply spray the weed-invaded place with pure white vinegar to kill them. The vinegar is a well-known weed killer and can be used for effective weed control everywhere in the garden. Spraying it,will kill weeds within 2-3 days after application. Energetically, spray the solution on and around the ‘ant hills’ in your garden. Also, inside your home, carefully examine the ants’ entry paths which include: the counter top, the sink area, and the windows. The naturally-strong odor of vinegar will make all these places [sprayed with vinegar] repulsive for ants! Common garden destroyers [that is rodents, moles, cats, dogs, rabbits, and deer] hate the strong scent of vinegar. You can keep out these ‘uninvited visitors’ from your garden by soaking several old clothes in white vinegar, and placing them on stakes around your garden where they usually hang around. You should regularly re-soak the towels every 6-7 days for better results. 5. Vinegar extends the life of cut flowers – keep them fresh for longer time! Add 2 tablespoons of vinegar and a teaspoon of sugar per liter of water. Combine 3 parts water with 1 part of vinegar in a spray bottle and add a teaspoon of dishwashing detergent. 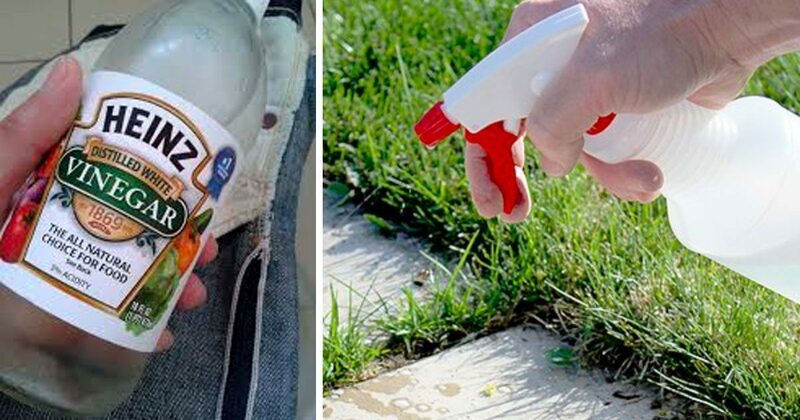 Shake the spray bottle to mix the contents thoroughly before using the solution in the garden. Mix all the ingredients together, and put that solution in an empty container. Hang it on any affected fruit tree -you’ll see how it will attract and trap them. So, go for pesticide free fruits! Note: The same or similar solution can be used for houseflies as well. You can keep the acid-loving plants [such as gardenias, rhododendrons, or azaleas] very ‘happy’ with vinegar showers. Although its effect is temporary, you can still give a quick acid boost to plants with vinegar. Mix a cup of white vinegar to a gallon of water (less than 4 liters) and water you acid-loving plants with this solution. The vinegar can be used to make your garden tools rust-free. Just spray [or soak] the tools in undiluted vinegar, and leave them for half an hour. Then rinse and clean the tool. You can also clean the birdbaths and birdhouses in your garden with vinegar. Out of many uses of vinegar, be they the above-mentioned and other uses, this one is perhaps the most popular use among gardeners. Yes, you can ‘magically’ kill slugs and snails with the help of vinegar. Add 2 tsp of vinegar in brewed chamomile tea. Spray this on the affected plants in your garden. Use vinegar whenever you need it in your garden or elsewhere. After all, it is cheaper, safer and more available than many other commercial chemicals. Do it for your plants’ sake as well as for nature’s sake. What comes around, goes around, doesn’t it?